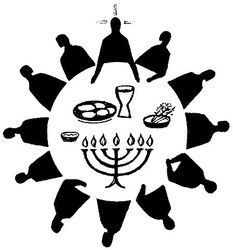 In the Jewish Passover meal, the seder, at one point the youngest person present asks the leader of the feast why they are gathered on this night, why they are eating this ritual meal. They eat it to remember: “This day is to be a day of remembrance for you...for all generations you are to declare it a day of festival, for ever.” By this meal, which can be repeated, the people remember how God saved them. Thus even for the people of Israel celebrating years after being freed from Egypt, the Passover meal was the real presence of God’s loving power. This reading, therefore, has a great solemnity: it is the foundation of the way of celebrating which gives us the Mass, the making present of the saving mystery of Christ. When reading this, it is worth remembering that the Eucharist is the meal of the New Covenant: the meal described here is the meal of the Old, or first Covenant. Thus this reading describes that original feast, which ‘gives birth to’ our feast this evening. This is the meal Jesus took to himself, so that his blood, ‘smeared on the doorposts of the heart’ becomes the sign of our escape from slavery. Second Reading: 1 Corinthians 11:23-26. This evening is about beginnings: we have heard of the beginning of Israel’s memorial feast - now we hear about ours. The line to stress here is the first: “This is what I received from the Lord.” It will be very easy for a reader to feel the importance of this reading - tonight you will read the words you are so used to hearing the priest say at Mass. Make the most of that feeling, and allow it to enhance the way in which you proclaim this truth we have all ‘received from the Lord.’ If you feel a sense of awe at reading these words, all well and good: the Lord is speaking, and his word is true. "Now he showed how perfect his love was."